From microblading to makeup, here's where to get the perfect brows! Microblading was the fastest growing brow treatment in the beauty industry, as microblading in Dubai beauty salons continues to be a popular choice. However, the semi-permanent cosmetic tattoo isn’t the only option for the perfect brows, as eyebrow shaping, high definition eyebrows, brow tints and even makeup also helps to increase the appearance of hair strokes and create a natural looking brow. Ellyssar Beauty Salon are specialists at Microblading and are offering Microblading including touch-ups, for AED 1750. The treatment involves manually implanting colour pigment beneath the surface of the skin by means of tiny needles to produce the appearance of hair strokes, makeup, and to naturally enhance features of the face. Taking between 30-45 minutes, the High Definition Brows experience features tinting, waxing and threading, with stylists using a specially designed formula to give you perfectly defined brows for AED 300. Or the Fluffy Browz treatment creates ultimate hyperrealism in 3D Brows with a semi-permanent, realistic effect for AED 3000-4000. The Benefit Cosmetics Brow Bar is known for reconstructing neglected brows and no needles are needed! Eyebrow experts use tinting, waxing, tweezers and magic makeup to renew your brows. And it’s not as expensive as semi-permanent alternatives. Feather strokes: For fine, natural-looking hair strokes, perfect thickening or augmentation of too-thin or patchy eyebrows and scar concealment. Brows by Patsy's micro-pigmentation can improve brows and achieve a natural, well-defined look. 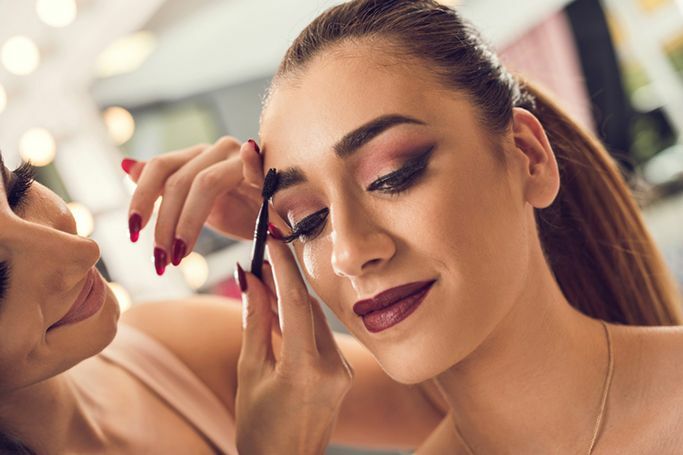 Brow Studio practises both Microblading for AED 2000 and Brow Sculpting for AED 210, as beauticians offer free consultation and advice for you to receive the best experience. Brow Sculpting is a short term semi-permanent treatment which involves tinting, waxing, tweezing, trimming and filling. From the Hi Brow experience for AED 210, to maintenance, eye brow tints for AED 63, Lola Brows for AED 300 and Microblading for AED 2362.50. Sisters Beauty Lounge also offers eyebrow extensions. If micro-pigmentation isn’t for you, then try expert eyebrow makeup! Anastasia Beverly Hills eyebrow products, including their Dipbrow Pomade, help to create fuller and more natural looking brows in the beauty salon’s dedicated eyebrow section.